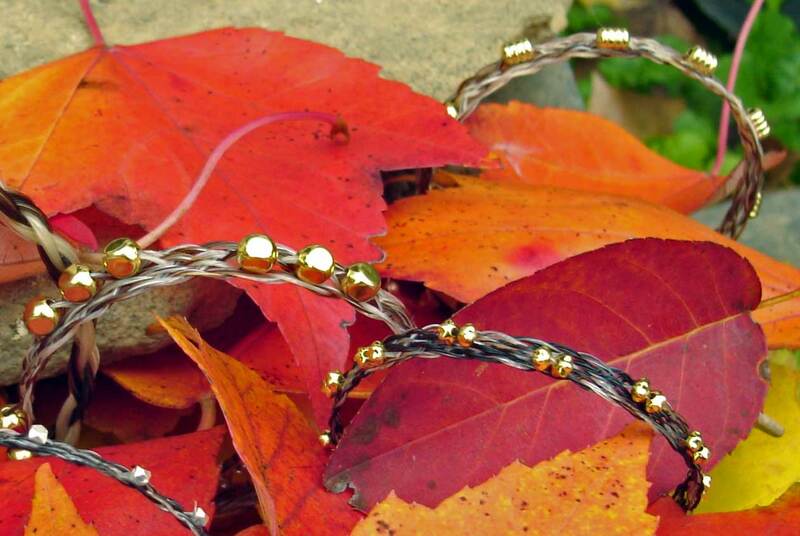 Gold and silver beads are braided into the horse hair. Aren’t fall leaves just the best background for photos? The neighbors probably thought I was nutty the other morning. After dropping my husband off at work, I stopped the car numerous times to pick up leaves. Who drives to pick up leaves? I was in a time crunch, folks. The horse hair bracelet at top left is a new adjustable version. The leaves made for great props in my photos. Above are some new designs I’ve been working on. The adjustable bracelet was inspired by a recent request. I loved making these delicate bracelets with the tiny beads woven with the horse hair. Two bracelets with engraved nameplates and an adjustable bracelet. All of these designs will be available for purchase next weekend at the Lehigh Valley Crafter’s Guild show at Swain School in Allentown, PA. Click here for more info and $1 off admission to the show. Stop on by to see us and bring your horse hair if you need a custom piece done. 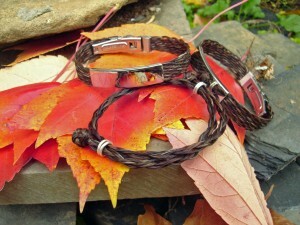 I also snapped some quick pics of the custom horse hair jewelry I’d just finished. 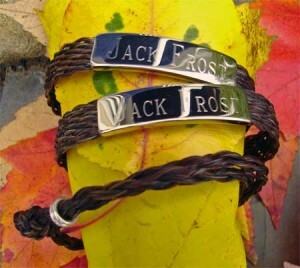 By now, these bracelets are on the arms of some very happy horsepeople. Just a reminder: Horse hair for custom Christmas gifts needs to be in my hands before November 26 to avoid rush fees. 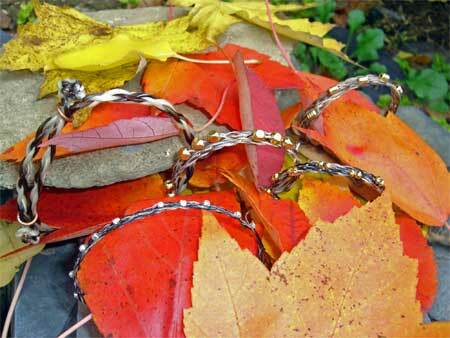 This entry was posted in Events, Horse Hair, Jewelry, News and tagged horse hair, Jewelry, Nature, Seasons by Susan. Bookmark the permalink.